Wow! Insanely busy two weeks with 14 different meetings, workshops and classes to teach, can’t wait for the growing season to kick in so I can have some time off. The conference last Friday on farming strategies for climate change was an all-day affair and the most interesting part for me was the State Climatologist’s talk about what we might be seeing here in the next 50 years. In many ways it was reassuring to hear his (and the climatology communities) best guess of weather to come. The bottom line is that the southeast has always had wild swings in weather and that will continue with events becoming more intense. From a growing standpoint while the fall first frost date appears to be moving back (creating a longer growing season) the last frost in the spring will not really be any earlier but there will be longer warm periods in early spring followed by frosts which is not a good sign for fruit producers who will lose blooms to the freezes. While less sure, it looks like we will have a small increase in rainfall but in more intense storms with longer dry periods in between making water holding capacity (ponds, etc.) and the ability to irrigate critical. Of course we will be having hotter summers with more days over 90 and warm nights that will affect both the plants and the farmers. 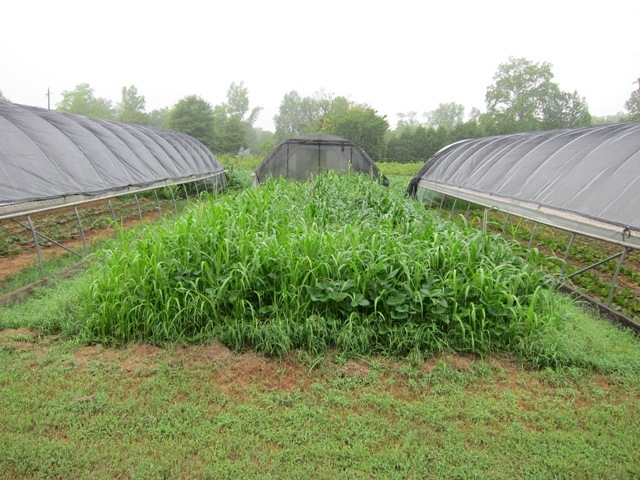 These are all things we have been seeing and adapting to for at least a decade and it is also reassuring to know that we have the tools in our reach to help manage the changes to come in long term ways like irrigation, crop diversity, good soil management practices and short term protections like high tunnels, shade cloth and row covers. There will certainly be changes here on the farm in the crops and varieties we grow and when we grow them and there are other unknowns we will have to deal with in new insects and diseases but that is just a regular part of farming. If you are interested here is a link to the extensive, just released, USDA report- Climate Change and Agriculture in the United States: Effects and Adaptation. A bit sporadic on the newsletter due to a computer that is slowly dying, some days it wants to play and others not, today is a good day (so far). The good news is a new computer is arriving next week so once I get it up and running all will be back to normal. The question that everyone has been asking all winter is “How is this warm weather going to affect the season?” Well the first shoe has certainly dropped with just about everything that could leaf out or bloom did so this past week, if it hadn’t already done so. Some things almost a month earlier than normal! This early bud break is mostly due to warm soil temperatures so it makes sense. The other sign of warm soils it that some of the warm season weeds, like crab grass, have begun to germinate. 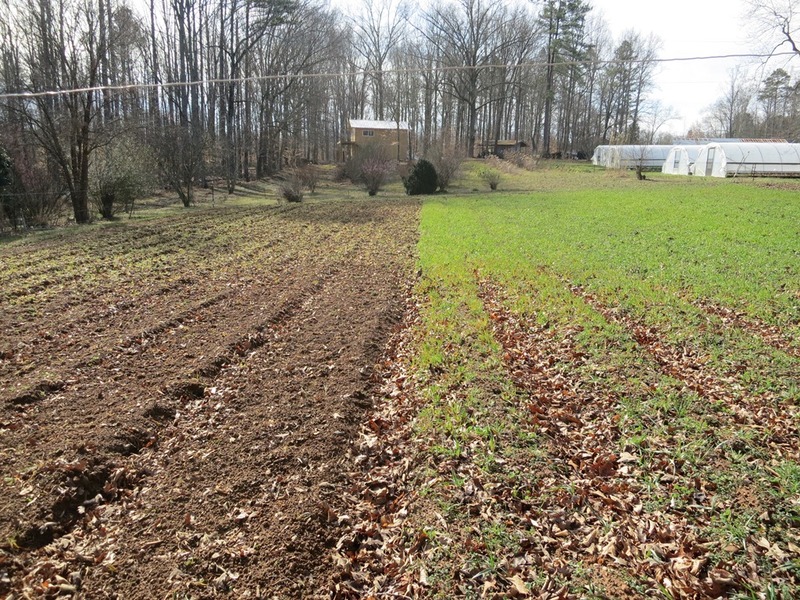 This could actually be a good thing if we can cultivate and dispense with at least once generation of warm season weeds before they really get going or before we plant the crops that they normally come up in. One thing that should not be true is that warm winters mean more bugs. The entomologists tell us that this is just an old wives tale. They too may come out earlier but the thought that cold winters kill off more insects is only true if we have really cold temperatures, like below zero, which we just don’t ever get here anyway. Now don’t hold me to this as almost anything is possible with the changing climate, new insects are moving in that we have never seen before like the brown marmorated stink bug moving down from the north and the kudzu beetle moving in from the south. 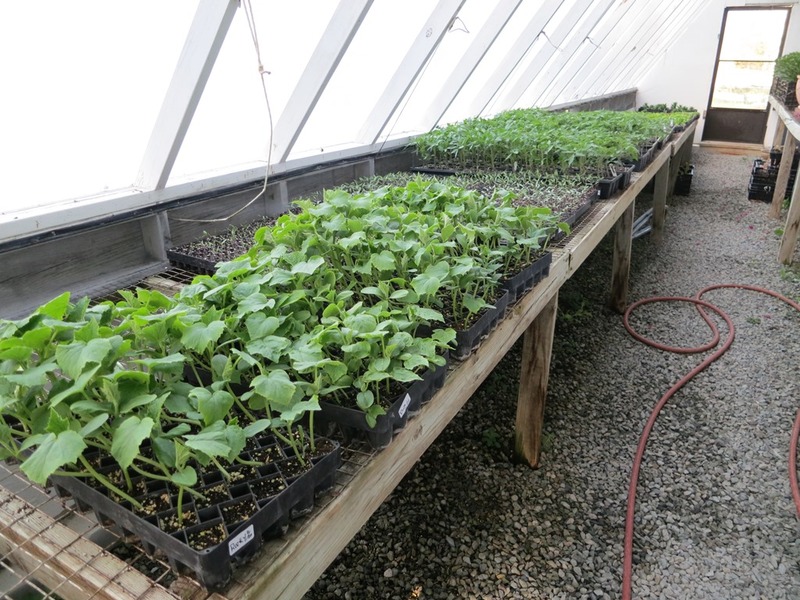 We have been cultivating (weeding) and planting like crazy. Almost all the spring crops have been gone through once and some are getting a second pass beginning today. 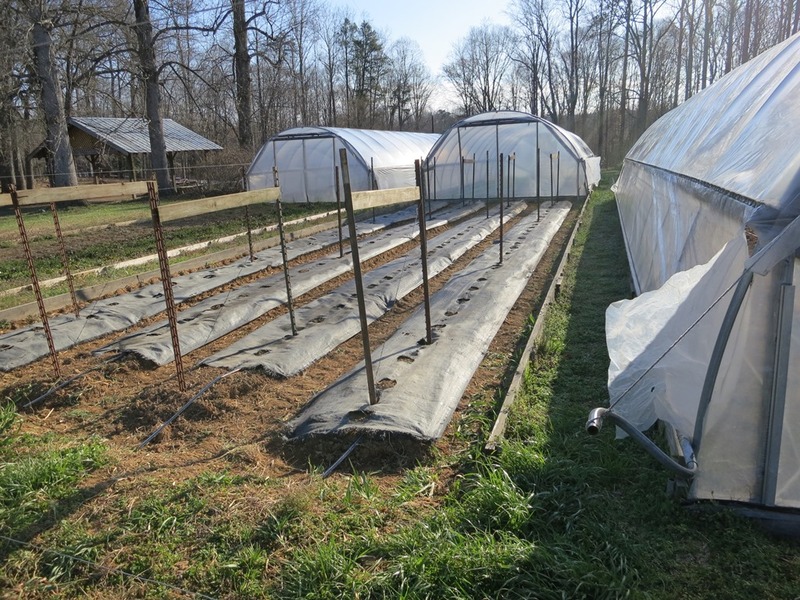 The first tomatoes were planted in the sliding tunnels yesterday and all of the main crop tomatoes were moved up into larger containers on Monday. 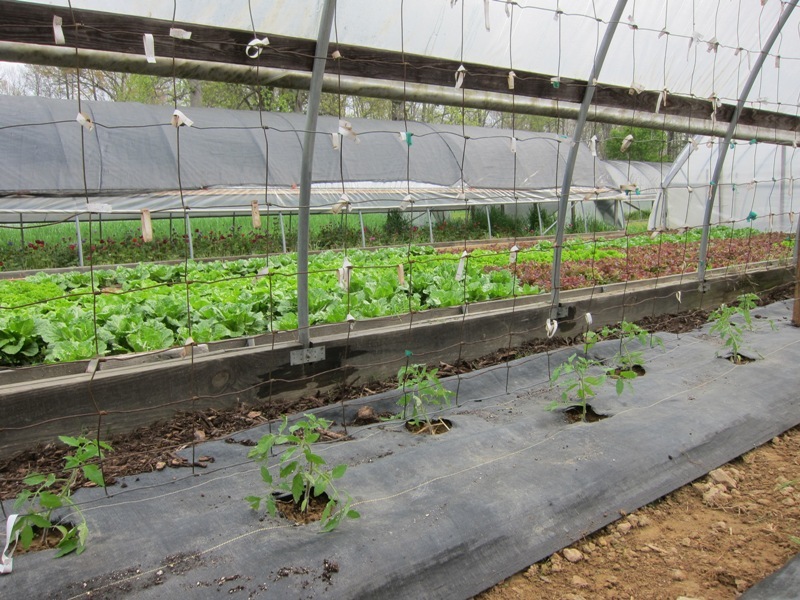 Soon we will have to be covering the Big Tops to prepare for the big tomato array! I am taking advantage of these few cool mornings to finish up the firewood cutting for next winter and then it will be time to retire the chainsaw for one more year. This big question now is will we get one more frost or not? And the skies opened. Wish I had carried my camera with me yesterday afternoon as I drove into town, I have never seen flooding on the Old Greensboro Hwy. like that, several places where you had to slow to a crawl to get through the water. Of course I started the day irrigating as I have gotten to the point where I just don’t believe the forecast unless it is for 70 percent chance or better and then I need to see it on the radar. When it is really hot, it is hard to catch up on soil moisture with drip irrigation if you skip a day. It started to rain lightly around 11:00 and I turned the pump off, 3.2 inches later and I can rest for a few days, irrigation wise. This heat and extreme swings in rainfall have many of us farmers beginning to think about how are we going to change our operations to meet the challenges of climate change, both practically (how do I continue to grow the crops I am used to) and quality of life (do I really have to grow crops in the summer?). Yeah I know, some think climate change is not happening, what ever. I can tell you after thirty years of wrestling with what nature throws at us, the climate is changing and the extremes are getting more extreme. It is those extreme events that determine the success or failure of a crop year, not if the average temperature has gone up .1 degree. We all know there is no such thing as normal or average weather anyway. Betsy and I do have a firm rule, make no big decisions in July! The good news is we have almost made it to our summer break. As many of you know we take the first week of August off, a tradition we started many years ago. It has been 22 straight weeks without a break or hardly a day off, a long time to run. So after market this Saturday we will change gears for a few days including not going to market on the 4th or the 7th. Always timed for when the early tomatoes have finished up and before the peppers really hit full stride. The staff gets a week off with pay so they will actually rest up too. We have no real plans other than hiding out here and going out to eat. There are still turkeys to feed and crops to water but that doesn’t take too much out of a day. So no newsletter next week and look for us back on Wednesday the 11th.